Plug the micro USB end of your charging cable into the charging slot on your battery and plug the other end into a USB charging port. There is a charging indicator on the kit. This will light up red when on low power, yellow when your battery is on half power and green when it is almost fully charged. When the T18E battery is fully recharged the LED light with turn off. Remember to not leave the battery unattended, do not charge overnight and do not over charge. Remove the battery from the charger when complete. Holding the clearomizer upright, carefully unscrew the top of the cap from the clearomizer and add the eliquid against the inside wall of the clearomizer. Do not add the eliquid to the airflow hole and try not to overfill. Once you have filled the clearomizer, make sure the cap is on tight to avoid leaking and wait 5 minutes before vaping. If you’re noticing a burnt taste when vaping, it means you will need to change your coil. You can buy Innokin Endura T18E coils here. To do this, make sure there is no e liquid left in the your T18 clearomiser. Hold the clearomiser with the thread facing up. Unscrew the bottom cap of the T18 clearomiser, hold the coil and gently pull to remove. Make sure you safely dispose of the used coil. Align the flat sides of the new coil and push to fully insert the new coil firmly into the clearomiser. Make sure the coil is completely inserted and firmly tighten the metal cap. To power on or turn off the battery, press the power button 3 times in quick succession. 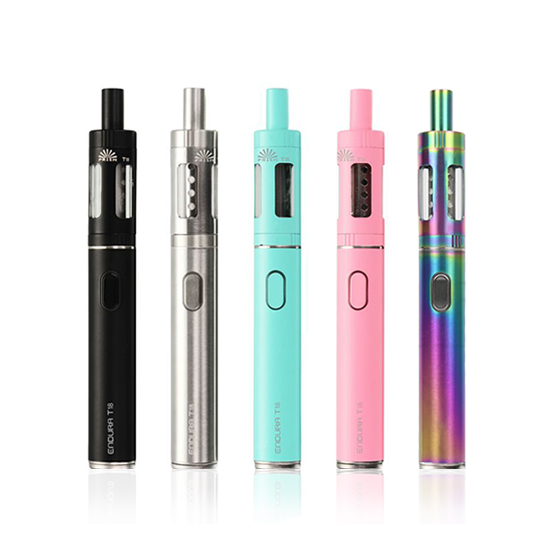 Once the Endura T18 is on, hold down the power button to activate the clearomizer. Remember to press the power button three times in succession to power off the Endura T18E when it is not being used, or when it is going to be stored in a pocket or bag.